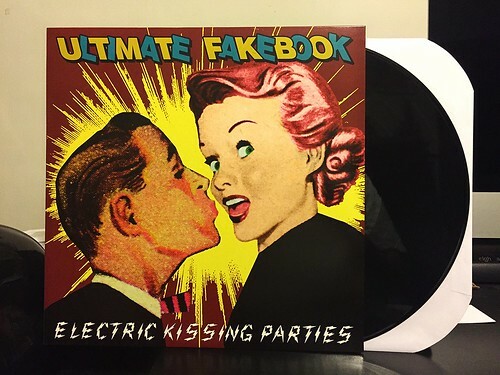 A few years ago Rocket Heart rereleased the first Ultimate Fakebook album on vinyl. It started with a Kickstarter plan and worked its way out to an actual release. I was a bad person and I didn't pledge any money for a copy. A few months ago, Rocket Heart decided to clear out some stock and make this LP available for pretty much any price you wanted. I threw down a few bucks to add it to the collection. Though this really isn't my favorite UFB record by a long shot, it does have its moments. Like most of the band's albums, this one is heavy on loud, beefy guitars and higher pitched vocal melodies. Sure, songs like "Far, Far Away" are about George Lucas and there's something inherently goofy about that, but the band finds a way to make it charming and ernest. They come off way better than you might fear after reading that they are writing songs about George Lucas. Sure, Electric Kissing Parties really can't hold a candle to Ultimate Fakebook's masterpiece This Will Be Laughing Week. That album was a band really hitting their stride. Rocket Heart tried to gather the funds to put This Will Be Laughing Week out on vinyl as well, but were not able to raise the outrageous some of money needed to wrestle the rights from Sony. It's a shame, but it really was a ludicrous amount of money they had to come up with. Don't blame me, I pledged for that one.